Buttery sweet spritz cookies get a low carb, gluten-free makeover. 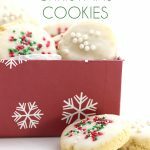 These keto Christmas cookies are perfect for your healthy holidays, and you can make them ahead and freeze them. This makes a ton of cookies, so it’s an ideal recipe for gift-giving. 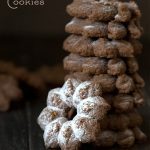 Or just make a half batch of these wonderful low carb spritz cookies and save them all for yourself! Someone has been holding out on me. I feel cheated, I feel robbed, I feel like I’ve been hanging out in the dark when everyone else has been living it up in the light. Why, oh why, didn’t someone tell me how fun Spritz cookies are to make??? 40+ years I’ve lived without the joy of pushing cookie dough out of a press into fun holiday shapes. Okay so some of this might be by own fault. I might have been unfair to the poor spritz cookie, thinking it a rather plain, flavourless cookie that had very little to recommend it to my taste buds. But in my defense, I have been offered many a plain, flavourless cookie that had little to recommend it to my taste buds so I am a touch gun-shy. Perhaps that was part of the conspiracy, to keep me in the dark about the joy of truly good spritz cookies. An evil plan indeed. 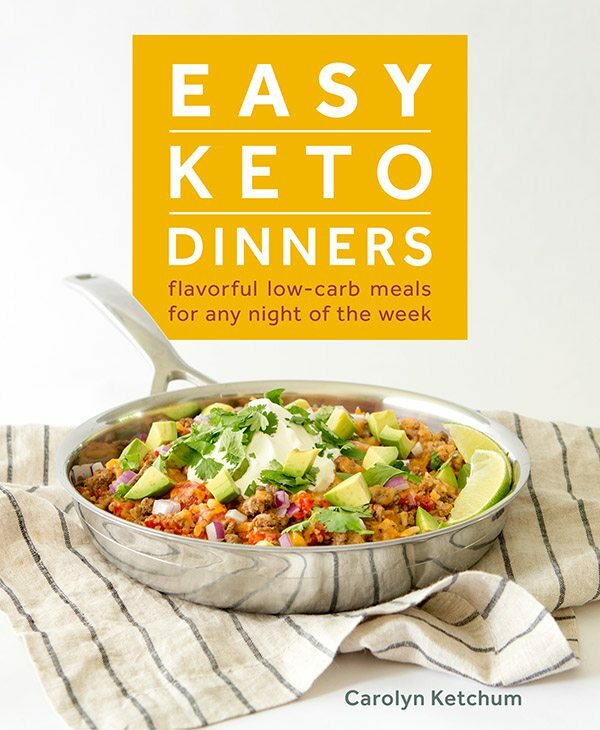 Check out these popular Low Carb Recipe Videos! Nevertheless, I prevailed. I didn’t grow up with spritz cookies in Canada, so they weren’t really high on my to-make list. But after many requests for a keto spritz cookie recipe, I broke out the cookie press languishing in my cellar and gave it a go. I knew I needed just the right dough, one that was soft enough to push easily through the disks and yet maintain its shape when baked. It was a huge gamble for me but apparently I was brave feeling brave that day because instead of just doing a little half batch, I threw caution to the wind and made a double batch. I wanted enough to give away as Christmas gifts and I figured I could put a few test cookies into the oven and if they were too soft, I could add more almond or coconut flour. After doing some research in spritz cookies, I also decided to add a little orange zest to enhance the flavour. 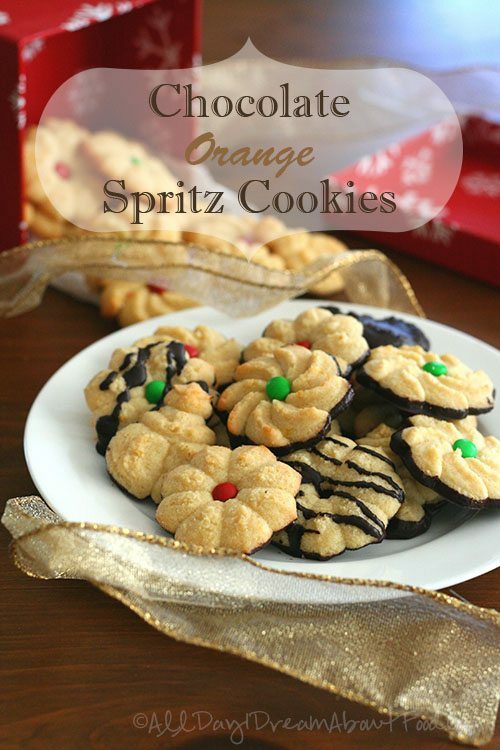 I came across a Martha Stewart recipe for orange spritz cookies and thought it sounded lovely. You certainly don’t have to add any to yours if you want straight up buttery spritz cookies but I have a hard time doing anything in “plain” flavour anymore. It’s the food blogger’s gut instinct to want to come out with a new and unique flavour for everything and my gut instinct also urged me to dip some of the cookies in chocolate. I apologize to spritz cookie purists, but this Canuck grew up with some British holiday treats, including Terry’s Chocolate Orange – you know, the one you crack open on a table and it actually comes apart like an orange??? Maybe you haven’t a clue what I am talking about, but it’s something many a child gets in their Christmas stocking in Commonwealth countries. So chocolate and orange just scream holiday flavour to me. 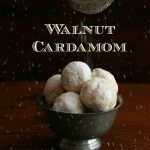 Oh my, what fun I had making these low carb holiday spritz cookies. I couldn’t believe that the huge batch of dough I made took less than an hour to shape bake into 90+ cookies. That press is amazing and awesome and a wonderful cookie-making time-saving device. Just a quick turn of the press and I had a snowman or a Christmas tree or a flower or a wreath. And when they came out of the oven, I popped a single mini M&M in the center of some of them. When they cooled, I dipped the bottoms of half the cookies in dark chocolate and left the rest plain. They looked gorgeous. And they tasted amazing too. They had a lovely orange-scented, buttery flavour and a slightly soft and yet slightly crisp texture. I think they are spot on, but you spritz cookie lovers will have to tell me if they meet your expectations. I sure hope so because these were a huge hit with friends and family. Buttery sweet spritz cookies get a low carb, gluten-free makeover. These traditional pressed cookies are also flavoured with orange zest and a little dark chocolate. For the cookies, preheat oven to 325F and line several large baking sheets with parchment paper or silicone liners. In a medium bowl, whisk together almond flour, coconut flour, baking powder and salt. In a large bowl, beat butter with sweetener until light and fluffy, about 2 minutes. Beat in egg, orange zest and vanilla. 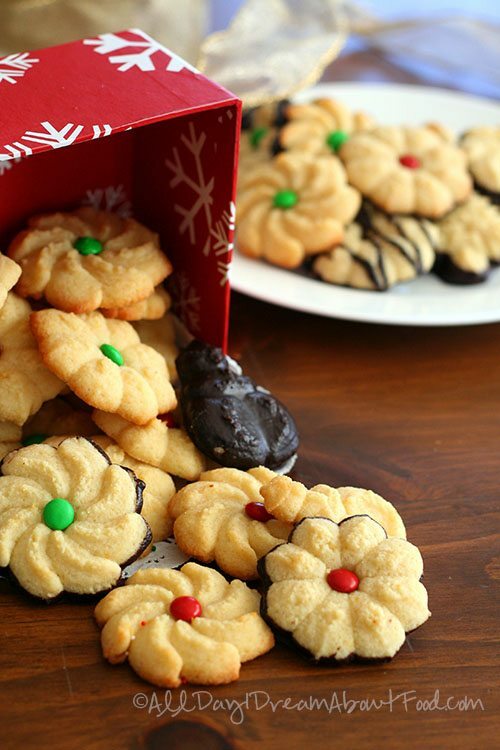 Fill the canister of a cookie press with dough and fit press with your plate of choice. Follow manufacturer's directions regarding how to press out cookies (mine requires a quarter to half a turn of the handle). Press cookies out onto parchment lined cookie sheets. If the cookie does not release well from the cookie press, try holding the parchment down against the cookie sheet as you lift the press. You also may need a bit more dough to come through the press to release properly. (This takes a bit of practice at first, but if you mess up and end up with a blob of dough, you can just pick it up and put it back into the press). Bake cookies 12 to 14 minutes, or until set but not browning much around the edges. They will be quite soft still. Add any decorations immediately upon removing from oven. Let cool on pans at least 15 minutes before transferring to a wire rack to cool completely. For the chocolate dip, place a bowl over a pan of barely simmering water (bottom of bowl should not touch water). Line a baking with waxed paper or parchment paper. Add chopped chocolate and stir until melted and smooth (if your chocolate is too thick for coating, add some butter or oil a tsp at a time until the right consistency is achieved). Add cookies, one at a time, face up into the melted chocolate so bottom is coated. Remove with a fork and tap fork against the side of the bowl gently to remove excess chocolate. Place cookies on prepared baking sheet and let set. You can dip all the cookies, half of them or none of them, it's up to you! Serves about 45 (90 cookies and 2 cookies per serving). Total NET CARBS = 2 g per serving. 114 Calories; 10g Fat (78.3% calories from fat); 3g Protein; 4g Carbohydrate; 2g Dietary Fiber; 20mg Cholesterol; 83mg Sodium. Oh, I can’t wait to try these. Maybe today, once I dig out my cookie press. They look so festive! Carolyn, I have a question… my favorite cookie of all time is not plain spritz but cream cheese spritz. Do you think if I subbed cream cheese for half of the butter this recipe would turn out? Huh…I think so. I can’t guarantee it but since cream cheese doesn’t spread as much as butter, I imagine they would be fine. Which kind of cookie press did you use? As a child my family had one and it worked wonderfully. A couple of years ago I bought the Wilton one and it was all plastic and a piece of junk. It made cruddy looking cookies. They just don’t make things the way they used to. I have one from Pampered Chef. The canister is plastic, but the plates and the crank are metal. The wreath and swirl cookies came out great. The trees weren’t quite as “tree-shaped” as I would have liked but I think it worked well for the most part. I just bought the OXO Good Grip Cookie Press. Shape are coming out nicely, Remember: Cool your cookie sheets to get cookies to stick. These are absolutely gorgeous, Carolyn! What a sweet holiday cookie, and I love that you made them low-carb. I officially have a food crush on you now! Thank you!! Do you think I could sub coconut flour for the almond flour? These looks so tasty, but I find I get a headache after eating anything baked with nut flours. No I am sorry. Coconut flour is a different beast altogether and wouldn’t work in this recipe. And in my experience, coconut flour does not make crispy cookies at all. Just cake-y and soft. Have you been tested for a nut allergy? sheet work ok? You are truly awesome. Love your recipes. I would probably roll the into balls and then flatten with the palm of my hand or the bottom of a cup. That would work well. 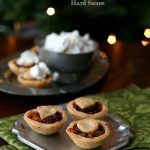 These look AMAZING…I will have to try them over the holidays! Happy happy Joy joy! 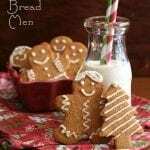 I will make these to put on the cookie plate with my grandmôthers cream cheese spritz and will be so happy to have something I can eat! 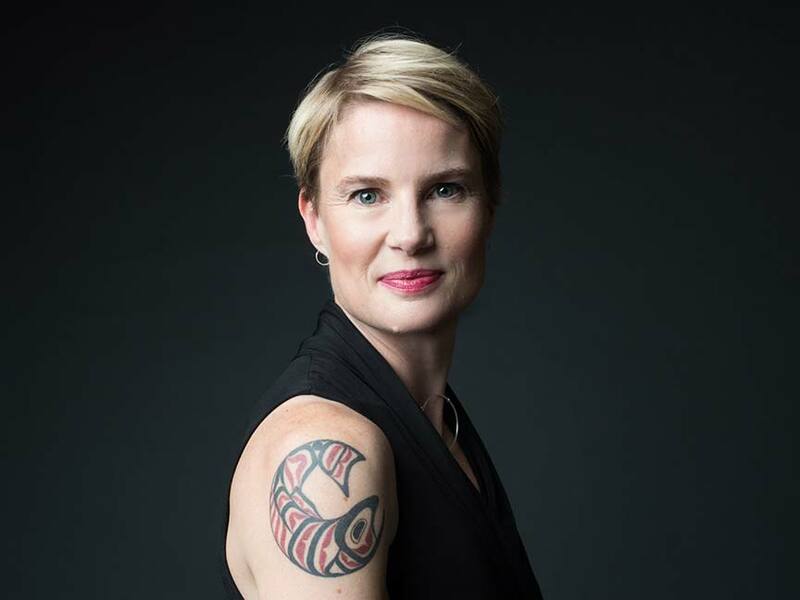 Thank you Carolyn!! Merry Christmas! My daughter has been begging to make cookies. We will be making these. Once again you rock!!! I wish we had wonka vision. 🙂 Carolyn, thank you for developing this recipe. I’ve been searching for one…not to mention try to make one myself without success. I can’t wait to make these!! 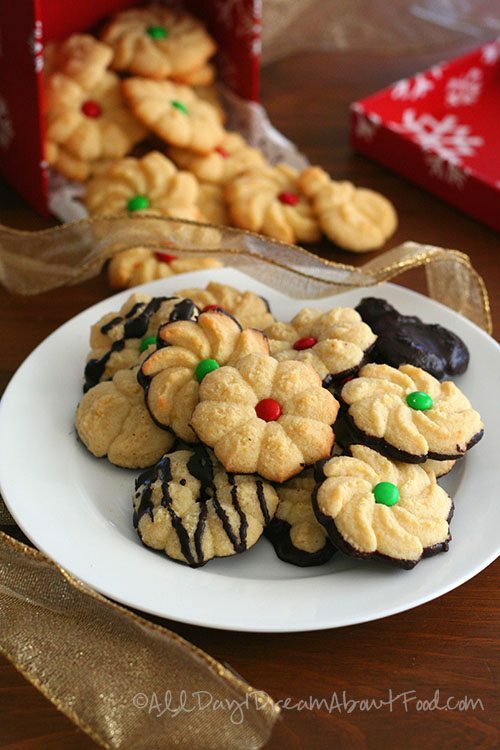 I haven’t had Spritz cookies since I was a kid – love this low carb version Carolyn – beautiful! I definitely will be making these in the next few days. Thank you! Ha, I was waiting for someone to catch that reference! just wondering what i could replace for swerve as i don’t have any here….thanks! these look AMAZING!!! You can try whatever you have on hand but I can’t guarantee the results. interesting….i have stevia…never heard of swerve…i’m just sugar sensitive at this point and staying away from gluten, etc… but have honey, syrup and stevia … new to this whole way of cooking…any ideas would be great! Thanks! I don’t think these will work well with any of those sweeteners, to be honest. Honey and syrup add too much moisture and stevia has no bulk properties. Swerve is an erythritol based sweetener, similar to (but better than) Truvia. Can you get truvia? I used the same amount but used XyloSweet (xylitol) and they can out fine. Oh thank you so much! I thought I wouldn’t be able to have these again. Thought we would try…. Pretty. But, don’t at all like the aftertaste of the sweetener. I will stick to sugar. Have you tried oat flour? So glad to hear that you AND the teenagers liked them! Do your calculations always include the erythritol carbs or not?? I always subtract sugar alcohols but was wondering if you did also? No, I don’t count the erythritol carbs at all. My nutritional software can’t handle “carbs” that aren’t really carbs. So I just subtract those from the get-go. Can’t wait to make these! I use the 1/2 c cream cheese & 1/2c butter in my “regular” spritz, so will try it with this recipe. I have my Mother’s and my Grandmother’s original cookie presses. One is huge and aluminum and one is normal size and copper and aluminum. I have so many disks! Nothing works as well as the old fashioned devices! Thanks so much for these recipes. My son has epilepsy and is on the Modified Atkins Diet. Please let me know how it turns out with the cream cheese! These turned out great! I used Palm Sugar and the cookies are darker, but delish! I sprinkled them with a bit of colored decorating crystals before baking. They are lovely and quite tasty. Did you substitute 1.5 cup of Swerve with 1.5 cups of palm sugar? Anything else I should watch out for with this substitution? Thanks. I was wondering if you think I could change out the orange zest for ginger? I love ginger and chocolate…. Yes, certainly. I’d say 1 to 1 1/2 tsp ground ginger would work, depending on how gingery you like it. I made these this past weekend! I grew up with my mother making spritz cookies for Christmas as long as I can remember. The only change I made (besides green food coloring) was 1 tsp almond extract to replace one of the teaspoons of vanilla. It’s a lovely enhancement to the almond flour! Since my husband and I can’t nearly finish 90 cookies, I took them in to work.. They were a hit!! Thank you for this recipe! Do you use granulated, or powdered? If it doesn’t specify powdered, then it’s granulated. Would confectioners work though?? I accidentally bought the wrong one yesterday. 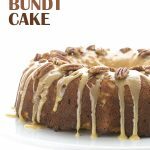 We loved this recipe! The orange flavor reminds me of my Mom who always made sugar cookies for us at Christmas. I’m so happy to have a cookie recipe that tastes amazing and is healthy. My son (5 years old) and I had fun bonding over the cookie making. If using sugar instead of swerve would you use the same amount? Yes, replace it in the same amount. 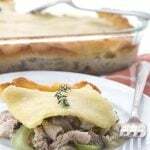 Hi, this is a great recipe, thank you for sharing it! I made it with brown sugar and they turned out very nice but too sweet for my taste. I was wandering if anyone tried it with less sugar. I don’t use sugar at all so I can’t guide you there. Sorry! so excited to find this recipe! I love your recipes! I just got a new Pampered Chef cookie press and want to try some low carb ones! Can I replace the almond flour with semolina or polenta? Some blogs also mention using sunflour(ground sunflower seeds) in place of almond flour. Neither semolina nor polenta would work. Sunflower seed flour might but you need to add a little lemon juice to make sure it doesn’t turn green. Can I sub swerve with xylitol? You are right. I am sorry about that. It should be Whisking those dry ingredients and then beating the butter with the sweetener until light and fluffy. Would this dough freeze well? I’d like to bake about half this week and take the rest to a Christmas party next week. I am not positive about the dough. It’s worth a try. I do know that the cookies themselves freeze well. Thanks! Freezing the cookies may be the better option. 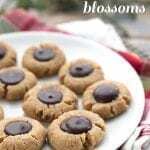 Have you used a homemade chocolate recipe for dipping cookies into using unsweetened chocolate? These are amazing. What else can I use instead of Swerve? 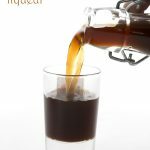 Will palm sugar or regular sugar work? Thanks. Regular sugar will be fine. Yes, since Swerve measures like sugar. i love the texture of these cookies. do you think i can use this recipe as chocolate chip cookies ? 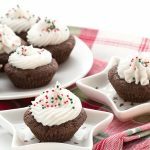 I found your recipe and I believe Santa will be happy if I can get this recipe right 🙂 we don’t have Swerve on hand but we have baking Truvia, how much should we use in replace of Swerve? Thank you so much for this beautiful recipe! Swerve measures like sugar so if the Truvia baking blend does too, then you can sub 1 for 1. These cookies are always a huge hit!! 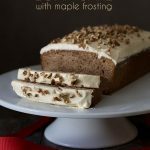 Such a wonderful recipe to have on hand! Definitely making sure my Momma has this one in her files! Thanks for this recipe! Our tradition was to color the cookies – green and red (or pink, I should say, as that’s how they turned out). Love it. May have to buy a press now! You could definitely do that! 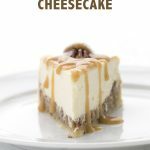 I am loving all of your recipes! Now you make me want to go out and buy the spritz cookie maker! I used to have one years ago and would make them when the kids were little. I haven’t bothered since they left, but this would make it fun for me again and I could eat Spritz cookies that were good for me! Oh these look so good, but I must be dairy free. What would you suggest to sub for the butter? can you use THM Baking Blend in place of the other flours? I’ve never tried it with these. It’s drier so you may have to adjust other ingredients. I’ve died and gone to heaven. I thought my first keto Christmas (4 weeks in) would be sans my annual spritz cookie making marathon but you saved my holiday! I just got through making a batch and they taste just like my originals, if just a little crunchier. I used lemon extract instead of the orange zest, and put a tiny dollop of sugar free raspberry preserves in the middle before baking them. YUM! YUM! YUM! I also used to make then with half butter and half cream cheese. Think I will try that next time. Do you think if I use the powdered erythritol it might make them a little less grainy? THANK YOU SOOOO MUCH!!! Now it REALLY feels like Christmas!!! I am thrilled to hear it! 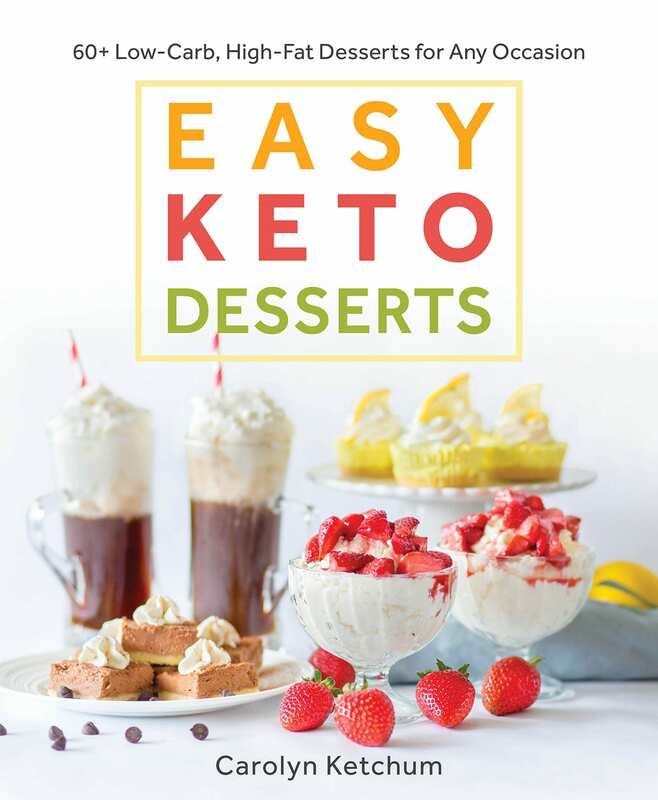 That’s my mission…no keto newbie goes deprived. I think half cream cheese should work fine, as will the powdered erythritol. Any ideas if I can swap the orange zest for almond extract? If so how much almond extract? You can swap it with whatever extract you like! The same amount should do it. Loving this recipe! 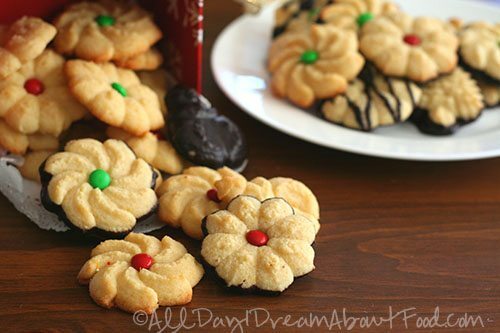 I always make spritz cookies at Christmas and this recipe actually comes out of my press better than my traditional recipe! I switched out the orange and vanilla for 2 tsp of almond extract, since that is the flavor I like for my spritz. Thank you for your effort! In the little Christmas ebook that contains the recipe, the butter is in the list of ingredients but not included in the instructions of the recipe. Fortunately I found it strange … (But what about butter?) And I checked on the site ..
Maybe you have done the correction since. These little spritz cookies are beautiful and super good. So many shapes to make . Kids love the make Spritz cookies. these worked out perfectly!! i halved the recipe, used half cane sugar and half coconut sugar (wasn’t looking for low carb, just gluten free with the flours i had), and used softened coconut oil instead of butter. i also used lemon as i didnt have an orange. they were beautifully crisp and held their shape well!! thank you!! Love the addition of the chocolate! These look delicious! Love the chocolate and orange combination this time of year! 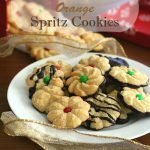 I’ve always loved the look of Spritz cookies and have a press to make them. I LOVE that you’ve made them gluten-free so my family can actually eat them now. Due to my families gluten allergy im always on the lookout for some grain free treats. I cant wait to give these a try! thank you! 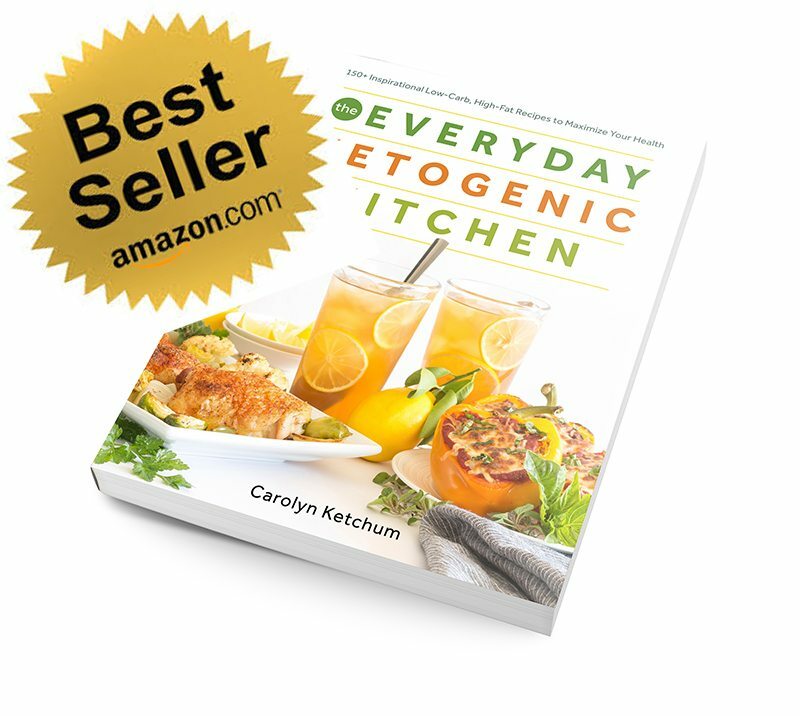 I have been greatly enjoying your recipes! Been keto for a little over a year but have always had a sweet tooth. We made these cookies every year as a child and loved them. I tried these the other day and couldn’t believe how well they turned out. Didn’t have to chill the dough to get it to the right consistency and went thru the press perfectly. Also really enjoyed the combination of orange and chocolate! Thanx! I would love to try these, but I do not own a cookie press. Any recommendations for a particular style or brand of cookie press? I have the one from Pampered Chef, but I think Wilton makes a good one as well. I have made traditional spritz for 40 + years. I halved your recipe to test it out before making large batch. The dough was too soft so I added a bit more almond flour. Still soft so I put in fridge for 20 minutes. That worked ok. (I know my butter was pretty soft having been out overnight, but it was not melty-next time I might only slightly soften the butter. I know too soft butter is a problem in cookie baking in general and always have carefullly handled my spritz dough so as not to overheat the dough..) At 12 minutes about 8 of the cookies burned at 325 degrees so that was a bummer. I should have watched closer but I usually have to add time…my 1/2 batch made 30 cookies. Different spritz guns make different size cookies. My old spritz gun made smaller cookies while my pampered chef spritz gun makes larger cookies (I used the Pampered Chef gun). I brushed melted chocolate on the cookie backs and drizzled a bit on the front. While I liked the flavor, they taste nothing like spritz cookies IMO. And they have a much courser crumb.In truth, I liked the raw cookie dough the best! Sorry you didn’t like them. But if they were coarse, then your almond flour wasn’t finely ground enough. And if your dough was too soft, again I suspect your flours and not my recipe.